Cultural anthropology has privileged the concept of ‘experience’ over that of ‘performance’ and as ethnographers we have also privileged the ethnographic text and inscription over the act(s) of fieldwork or the ‘performances’ of ethnography. Although we have made some improvements toward a different kind of anthropology, one which is embodied, the investigations of the body and performance have ultimately remained on the margins of the discipline. Drawing from my ethnographic-participant fieldwork with North Indian tabla players and the teaching of ethnomusicology labs at an American University, I argue for a turn to what Sarah Pink (2009) has called sensory ethnography. 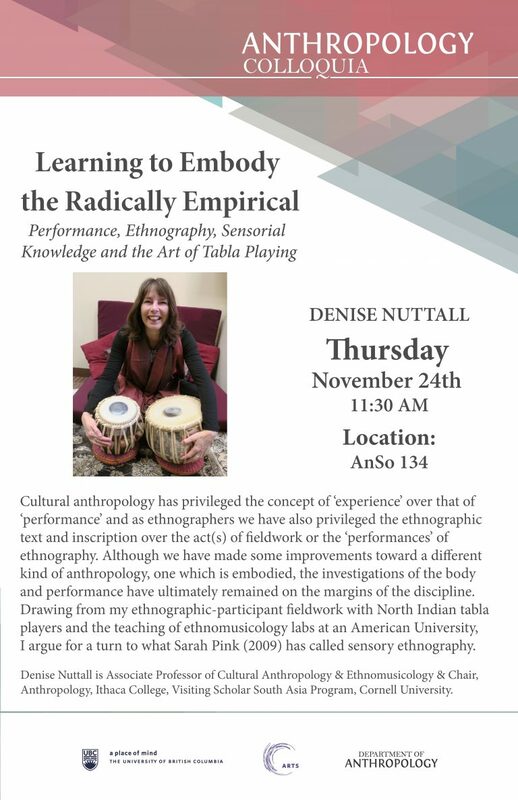 Denise Nuttall is Associate Professor of Cultural Anthropology & Ethnomusicology & Chair, Anthropology, Ithaca College, Visiting Scholar South Asia Program, Cornell University.